Cells divide following a series of defined steps that involve changes in protein expression, cell morphology, and DNA synthesis. The distinct events within the cell cycle process can be categorized into five main phases. Cells starting at a resting state or G0, will proceed to Interphase (G1, S, G2) followed by the M phase (mitosis and cytokinesis). As proliferating cells transition from G1 to M, the DNA content will double as the chromosomes are duplicated. Analysis of cell cycle, via monitoring the quantity of DNA is routinely performed by flow cytometry and is a common assay for the platform. DNA binding dyes such as Propidium Iodide (PI), 7-AAD (7-aminoactinomycin) or DAPI are used to measure the change in DNA content of cell as they transition through GO, G1, S, G2 and M phase. The cell cycle kit is a ready to use reagent to monitor cell cycle consist of a detergent, Propidium Iodide (PI), and RNAse A. The detergent permeabilizes the cell membrane, allowing the PI to access the DNA. RNAse A ensures elimination of RNA which is also labeled by PI and which can interfere with the interpretation of results. The cell cycle kit has been developped to stain cells fixed either with alcohol or formaldehyde by re-suspension of the fixed cell pellet into 0.5 mL followed by a 15 minute incubation prior to acquisition on a flow cytometer. 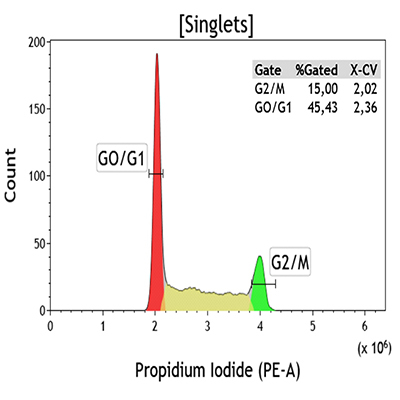 With an excitation/emission spectra of 493/636, Propidium Iodide can be excited by a 488 nm laser and detected in a cytometer equipped with the appropriate filter.